Potters Guild members meet to support, educate and motivate fellow artists working in clay. Anyone who has an interest in ceramics or works in clay is welcome to join. The Guild manages a library of relevant books, video tapes and DVD's, produces a monthly newsletter, organises monthly presentations on a wide range of related topics, facilitates workshops, arranges exhibitions of members' work, and advertises local pottery shows and events. 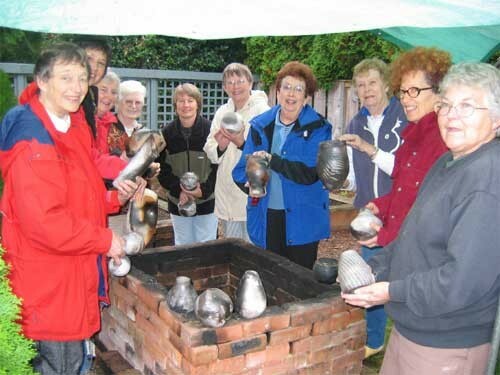 The Guild facilitates many clay related activities and workshops. A small group have just unloaded a pit firing. The Guild organises an annual show and sale each year in June. The Guild is a group member of the BC Potters Guild and the Community Arts Council of Greater Victoria and participates in initiatives such as Souper Bowls of Hope which raises funds for the Youth Empowerment Society in Victoria. Current president of the South Vancouver Island Potters Guild is Muriel Sibley of Winter Creek Pottery. The South Vancouver Island Potters Guild began in 1999 and today has over 80 members, covering the area extending from Cowichan to Sidney to Sooke. Our membership ranges from Art College graduates to self taught potters, and runs the gamut from novice to hobbyist to professional. We also welcome anyone with an interest in clay and the ceramic arts. Annual Membership fee: $30. Visit www.victoriapotters.ca for more information. 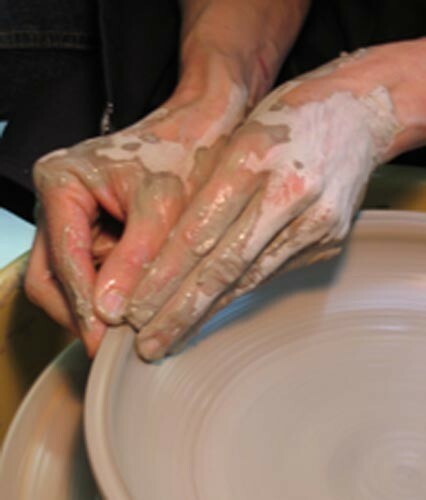 The Potters Guild meets the second Monday of each month (except July and August), 7:30 pm, at the St Michael's Anglican Church hall at 4733 West Saanich Road, Victoria. (Please check www.victoriapotters.ca for other date changes and more information. The Guild does not have a permanent location.